Posted June 5, 2017 in Uncategorized. August 28th 2017 will be Jack Kirby’s 100th birthday. Clearly, a good deal will be written about this occasion. I’d like to say something about what this event means to me, having grown up in a time period that had one foot in the old-world ways and one in the new. I was born in 1952, just seven years after the end of the great war, and that conflict’s mythology loomed large in my life. I lived in a predominantly Jewish neighborhood. Abe Zimmerman, the Candy Store proprietor had Dachau numbers tattooed on his forearm. Needless to say, it would be a tough sell for someone to try to convince me that the Holocaust never happened. To us neighborhood kids, the war represented good’s conquest over ultimate evil, and Jack Kirby’s characters embodied that epic. 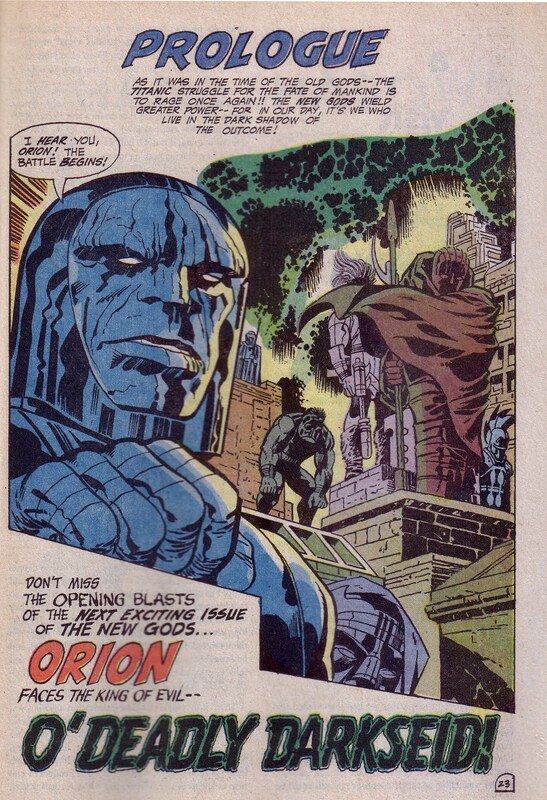 It felt like Jack Kirby was an American in the old-school sense. Few comic book creator’s heroes felt quite so righteous and principled. The United States is a nation whose credo was written on a plaque in 1903, inside the Statue of Liberty, which stands in New York harbor. “Give me your tired, your poor, Your huddled masses yearning to breathe free. The wretched refuse of your teeming shore” is part of the text on the statue’s plaque. Kirby’s parents were just such “wretched refuse” as the poem was referring to. They were Austrian Jewish immigrants. and Kirby was raised on Essex Street in the bustling Lower East Side of Manhattan. When the call came in the 1940’s for America to fight the fascism fomented by a former Austrian Corporal turned dictator, Kirby went to France under the command of General George S. Patton. Kirby came to Paris as a liberator. The page from Young Romance #10 above tells the story of a soldier that could easily have been semi-autobiographical. Kirby knew well those hedge rows, ruined towns and blood-drenched fields he wrote of. When he returned to New York, he was a vastly different man, one who had seen the face of death countless times. He was no dull-witted killer who could shrug off such experiences. Every impression burned itself on his raw artistic sensibilities. His only defense against carnage was to transform it into art. 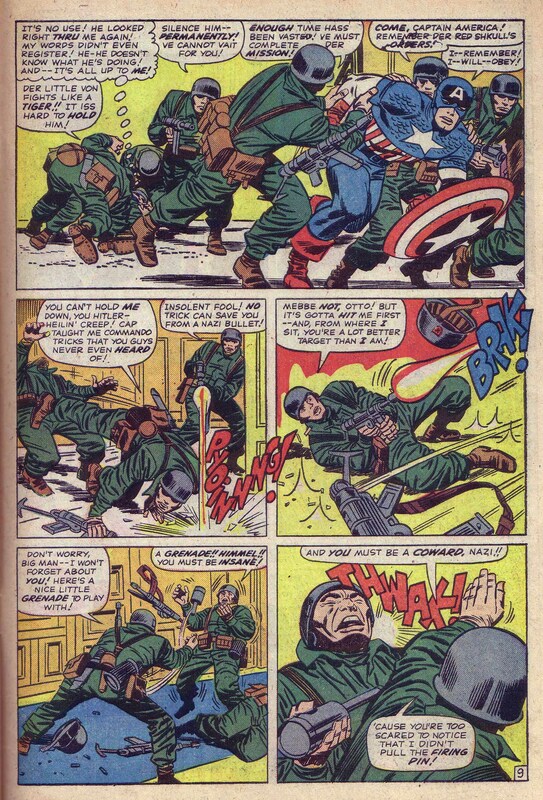 Kirby’s Captain America was the embodiment of his creator’s righteous rage at the forces of naked savagery that the artist had endured. Here on this page from Tales of Suspense #67, we see Cap, under the insidious spell of the Red Skull in the company of a squadron of Nazis. 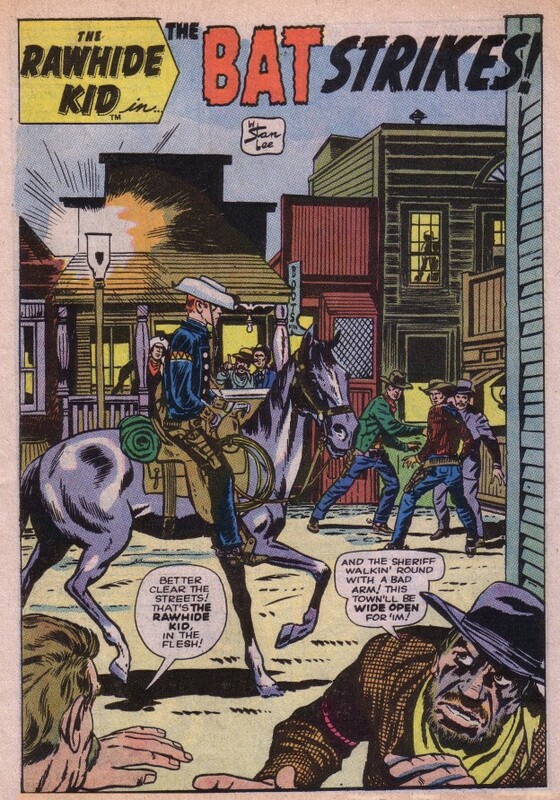 This panel has long been one of my favorite examples of compositional Kinetic energy. Every shape making up the structure of the surrounding Nazis is designed to give Captain America forward propulsion. 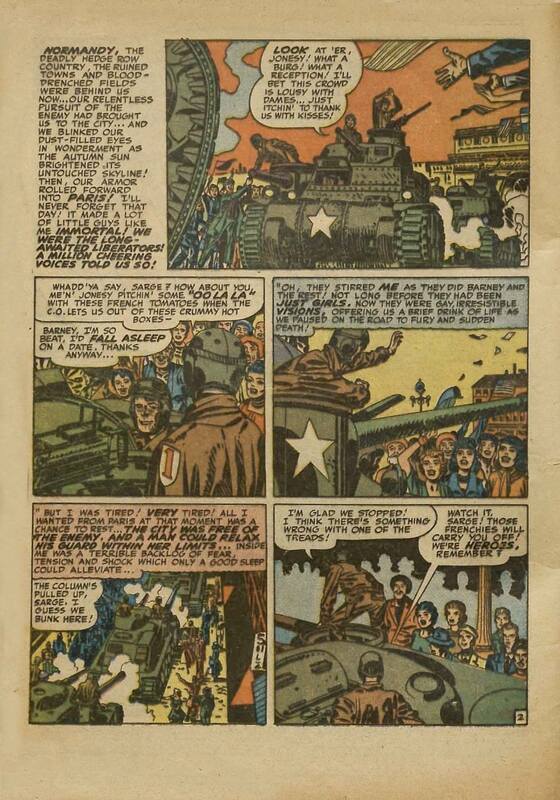 In panel two, Bucky explodes from a Nazi’s grip, while dodging a burst of machine gun fire. His rage is palpable as he snatches up a weapon and returns fire. There is no clever caption that suggests his bullets are less than lethal. 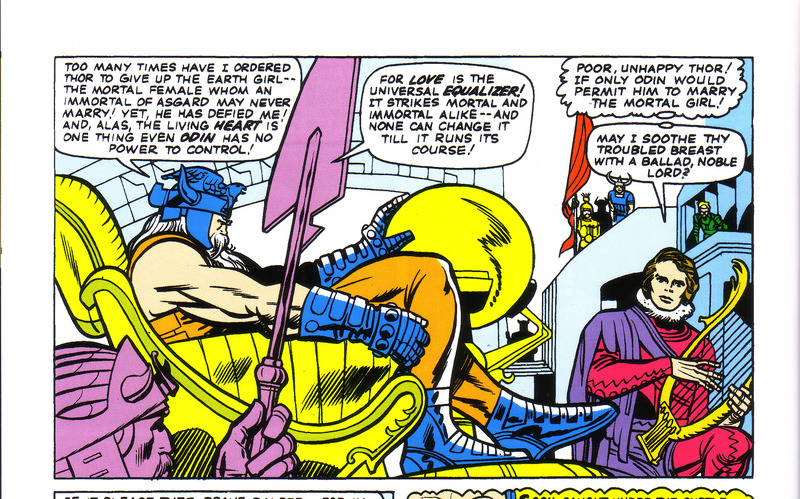 There would be no point in trying to tone down the savagery of Kirby’s rage, channeled through Bucky. 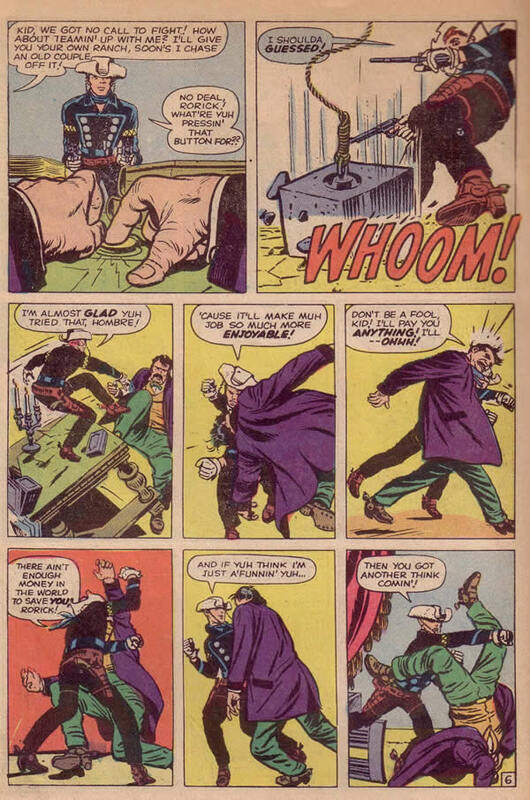 Next, he cleverly uses a grenade to outfox another Nazi and then subdue him in hand to hand combat. There is something primal about the pages of this series from the mid-sixties, focusing on Captain America’s wartime adventures. Seldom again would Kirby return Cap to this period. Here, by bringing his golden age hero back to the time of his inception, Kirby appears to be exorcising some of his demons. The specter of Hitler’s Nazism was the very antithesis of the 20th century American dream. Teutonic racial supremacy vs. cultural inclusion and assimilation. Never mind that Steve Rogers was the spitting image of blonde, blue eyed Aryan godhood. He’d been born stunted and frail, but the spirit of American progressiveness had made him whole and infused with indomitable power over evil. This was the symbolic America of my youth. Without generosity of spirit and the dream of justice and equality, there could be no strength to overcome adversity. Posted December 14, 2016 in Uncategorized. Recently, I noticed that writer and Comic book aficionado, Richard Kyle passed away on December 10th. 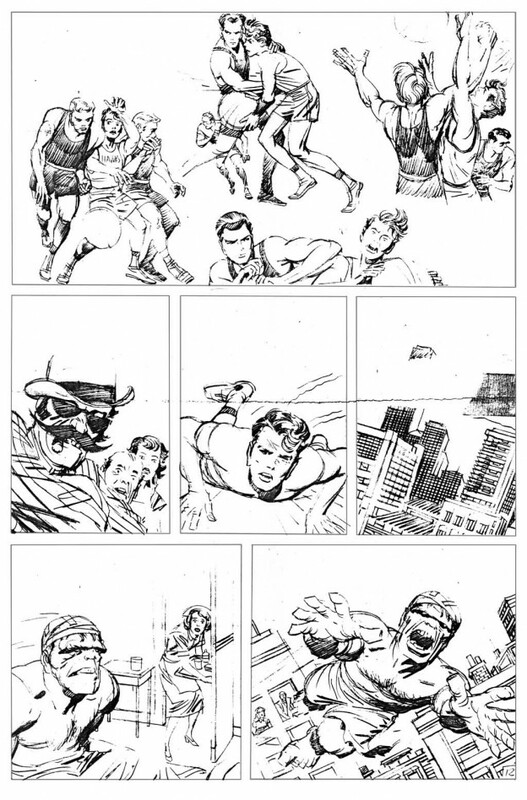 Kyle, who coined the term “Graphic Novel,” was also responsible for inspiring Jack Kirby to write and draw the short story, “Street Code”, having offered the King a modest sum to tell a personal account from Kirby’s past. 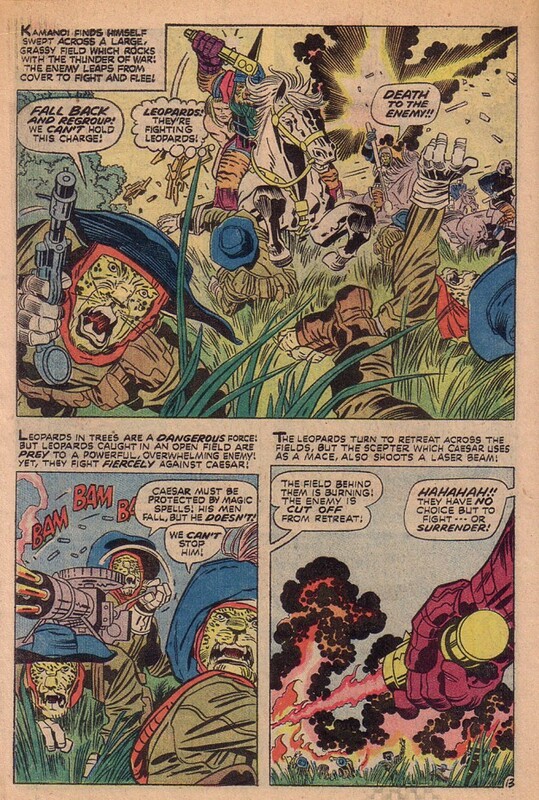 Hearing the news of Kyle’s death brought me back to an article of his that I had read in The Jack Kirby Collector#9. 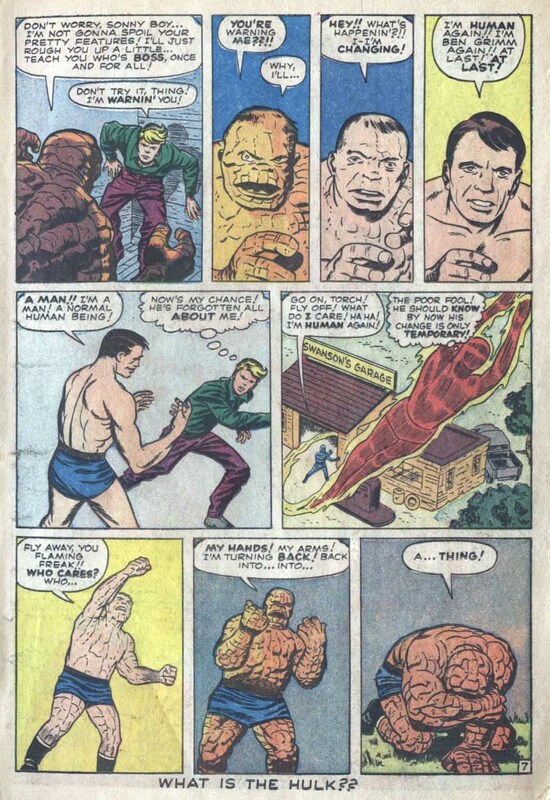 The article was originally published in the spring of 1967 in the seventh issue of a magazine called Fantasy Illustrated, and it appears to have no title other than “Graphic Story Review.” It is about the impact that The Fantastic Four had on Kyle’s world when it was first released in August 1961. It is a wonderful article and is extremely insightful by way of making the point of why the Kirby/Lee team of Superheroes fit so well into its time period, the 1960’s. For decades, I’ve been trying to understand just what it was about the Fantastic Four that took such a powerful hold on my imagination. I did not discover the Fantastic Four until issue #12 in 1963. 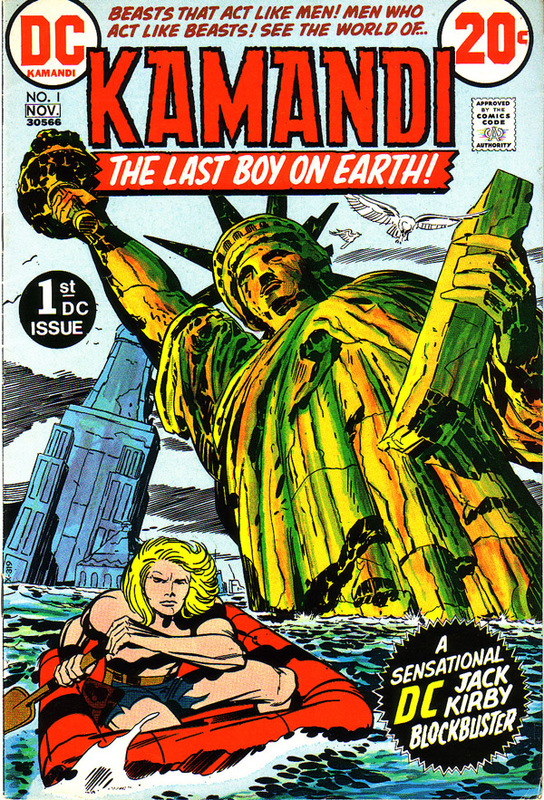 I was eleven years old and after reading several issues if the comic, I delved back, trying to obtain earlier issues. When I read issue #4, I was struck by the difference in the look and feel of the older book compared to an issue little more than year later. I chose this page from issue #4, because it displays the strong animosity between two of the team members, the Thing and the Human Torch. 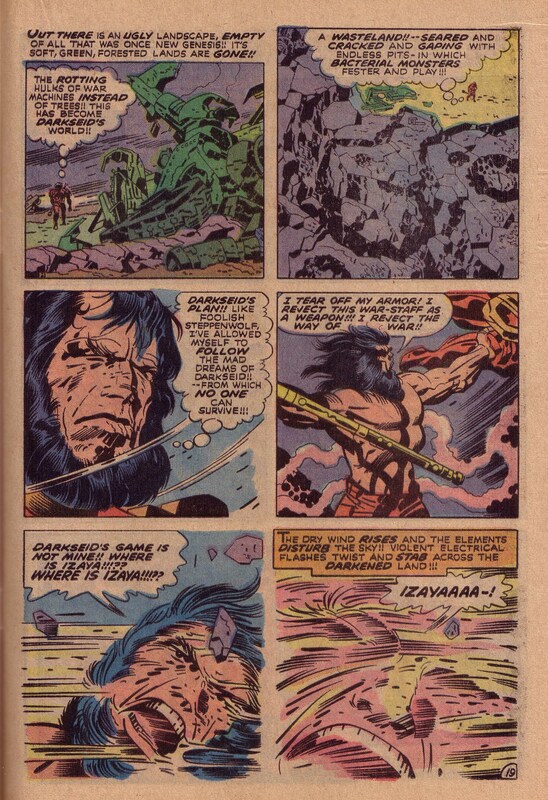 It is established early on in the series that the Thing is extremely angry and bitter over his monstrous physical condition and in particular, he resents the teenaged Human Torch because he sees the youth as a spoiled brat and a glory hound. 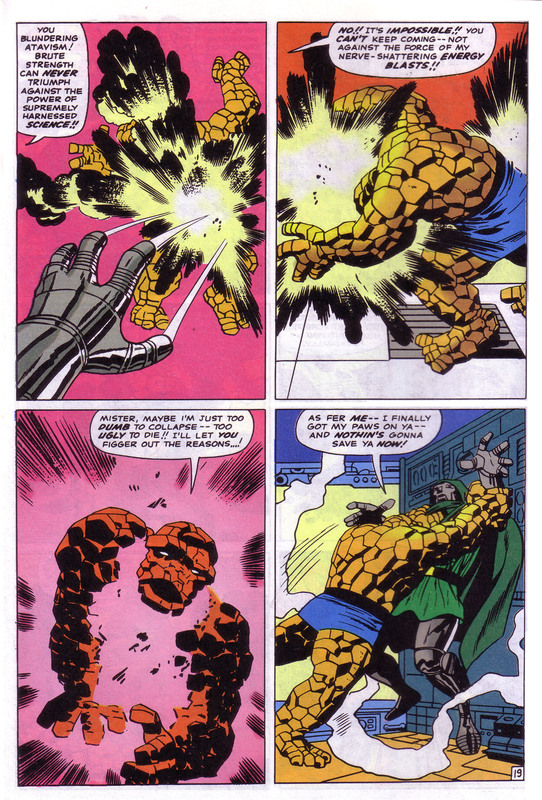 In these early issues, this is a deadly serious quarrel and the intensity shows in the darkness of this page as the Thing, about to attack the boy, reverts back to his human self and then tragically becomes a monster again within a matter of seconds. This is a very emotionally dark and powerful moment for a superhero comic, and it leaves a strong impression. Within three to four issues, the tone of the book became lighter as the group struggled to resolve its issues and gradually, a spirit of levity pervaded the stories, but never to the extent of undermining the dramatic developments that would ensue. What gradually emerged was a species of sitcom about a dysfunctional family trying to make sense of the 1960’s, which was certainly a tumultuous period of social change and experimentation. On April 12; 1961, Russian cosmonaut Yuri Gagarin became the first human in space. In May, astronaut Alan Sheppard followed him. In October, the film, West Side Story appeared on screens, dramatizing the racial disharmony between two rival gangs. The Romeo and Juliet aspect gave us hope that our humanity would overcome our differences. “We Shall Overcome” became a common sentiment of the 60’s. In November 1963, President Kennedy was assassinated and then in early 1964, the Beatles came to America. They seemed to embody a spirit of youth and exuberance that was moving over the waters. Words like “Youthquake” became popular. Something about The Fantastic Four also felt like a fresh young treatment of the Superhero concept that was a mere quarter of a century old. Perhaps it was the teenage Human Torch, whose flame power appeared to embody emotion. Johnny Storm, the teenage Torch certainly felt like a late 50’s or early 60’s kid, with his blonde pompadour and his hot-rods. 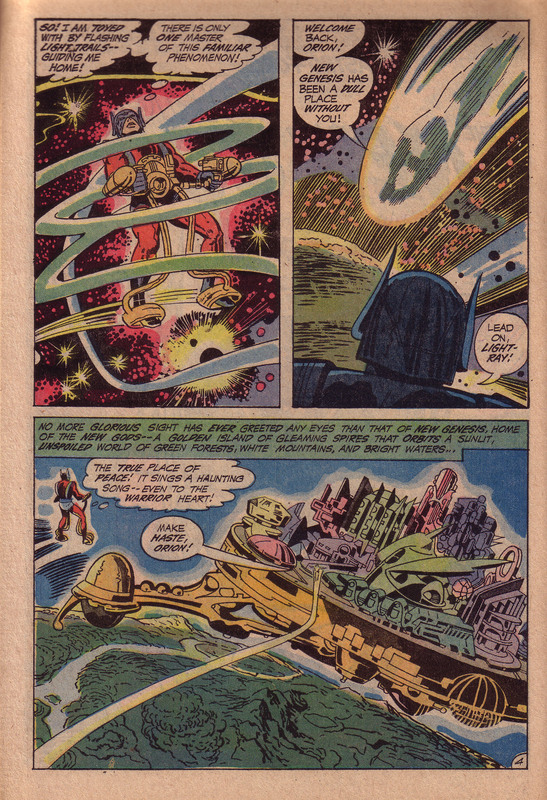 However, in 1966, in what became known as the “Galactus trilogy”, the Torch became an “experienced”mind, as he flew through some sort of hyperspace, attaining Cosmic Consciousness while traversing intergalactic doors unknown to mankind. The art of the page shows the transformation on his face and mind akin to a hallucinogenic trip. Johnny Storm along with Galactus and the Silver surfer has taken his family, The Fantastic Four into tomorrow. Now, this was written in 1968, and a lot of comic water has flowed under the bridge, but Kyle is on to something here. 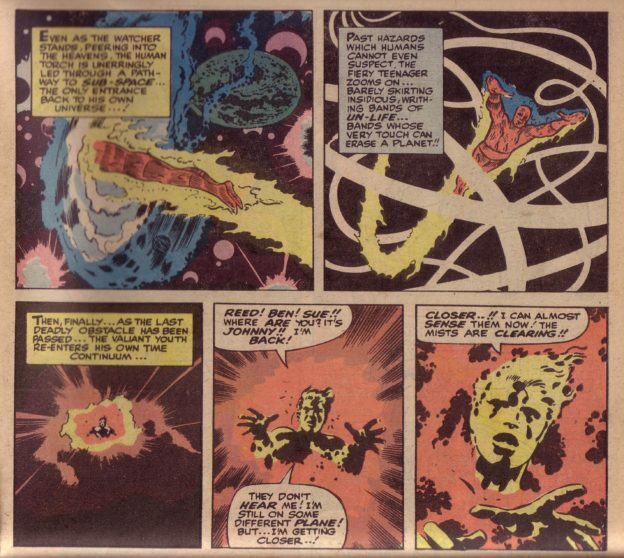 As times and places go, he is certainly right about getting it right, and if Johnny Storm wasn’t the next Man of Tomorrow, The Fantastic Four surely did ‘Get Right’ the essence of a team that contained the psychic and alchemical balance that could represent the sixties as far as superheroes are concerned. Posted September 28, 2015 in Uncategorized. But looking at the work that I did even back then, I realized that I must have intuitively absorbed the best aspects of artists that I had admired. Artists like Kirby, N.C. Wyeth, Tiepolo and Frank Frazetta. My best stuff had good composition, without my even realizing that I had internalized those concepts that allowed me to compose well. This page, from Captain America #112 is a perfect example of Kirby using composition about as effectively as it is possible to do. Nearly every aspect and detail on this page brings the viewers eye from point to point and exactly where Kirby wants it to go. What is most notable about this page is that it consists of two very strong tableau panels on top of one another and yet they work together as a single strong composition as well as individual pieces. Each has the big O circular composition and yet there is a larger O made by the two panels together. Notice that the eye enters the page with the man in blue whipping a white sash on the left of panel one. 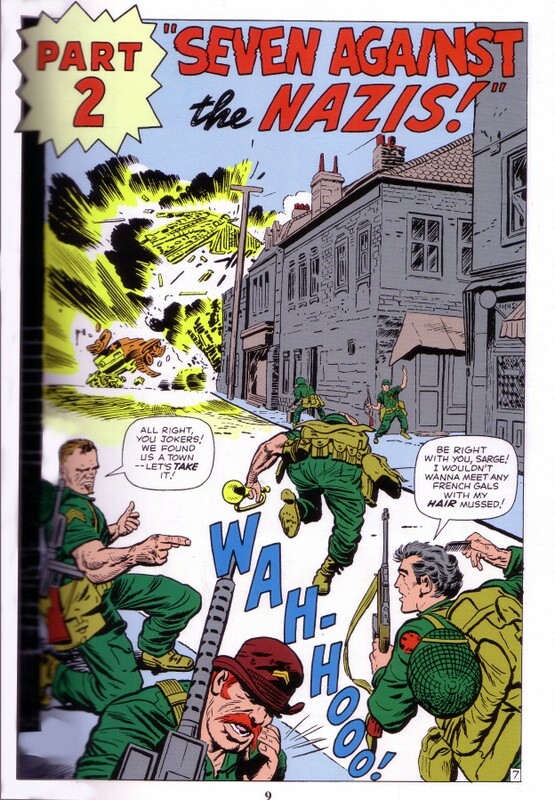 The swirl of his sash emphasizes the rightward momentum toward the man in the wheelchair and travels around the green suited man and then to the naked torso of the wrestler who reaches for Cap’s shield. This motion brings the eye directly to Captain America. The man with the steel fist and the Asian pointing his gun reinforce Cap’s centrality in the composition. The eye must fall finally on him. However, those lower two figures also function to bring the eye into the lower panel. 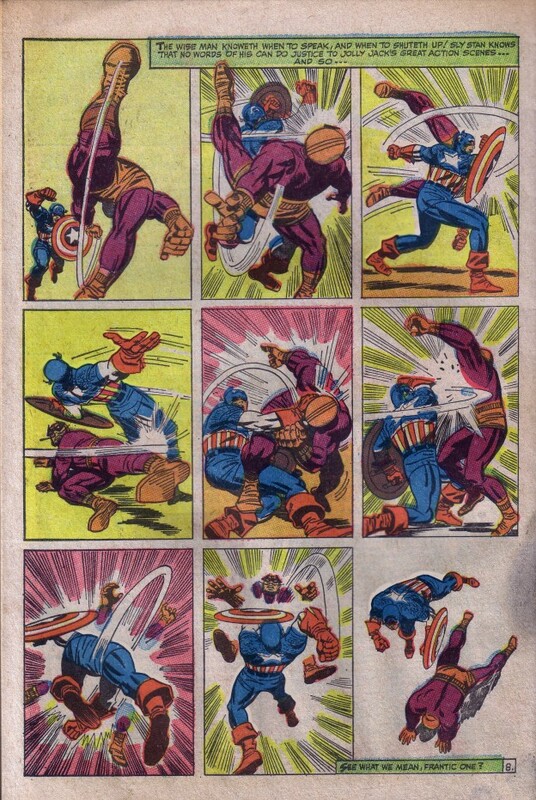 The diagonal gesture of the steel armored fist in the upper panel emphasizes the sweep of Cap’s fist slamming into the wrestler in the lower. 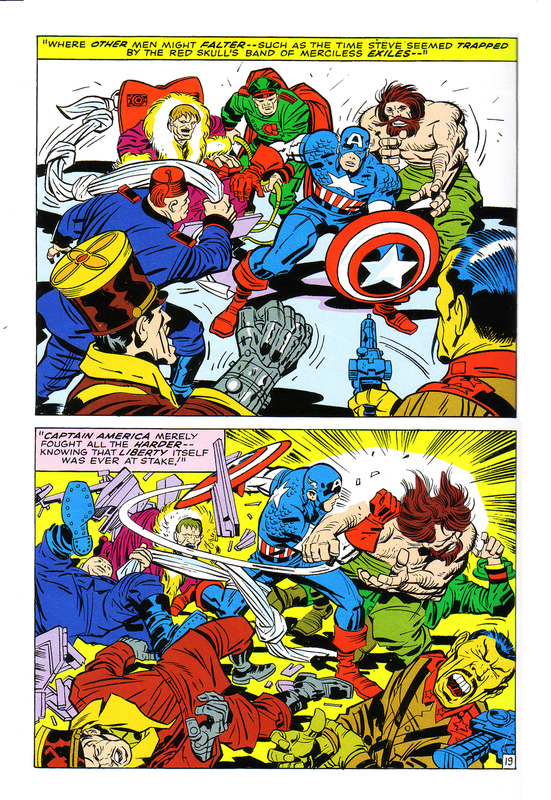 Of course, the sweep of Cap’s blow, among other gestures and objects creates the circularity of the entire page’s composition. 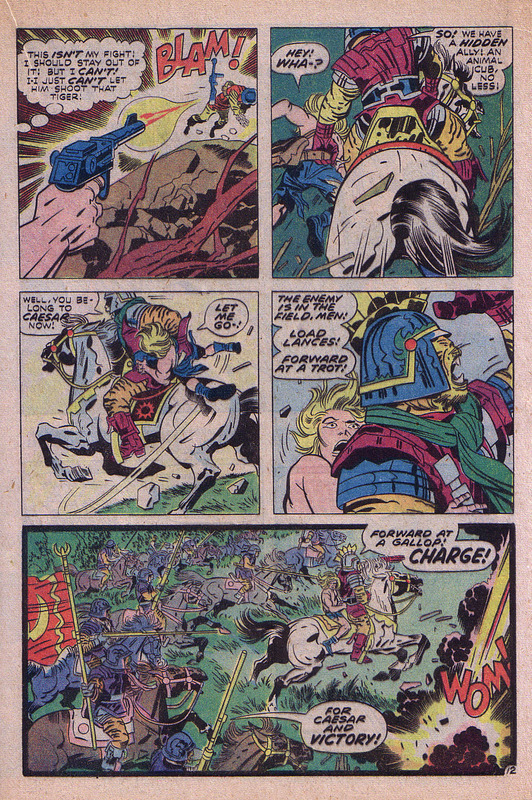 Kirby had been excelling at this sort of thing for decades. Here’s a double splash panel spread from Captain America #7 below, showing the use of a profusion of circles and general circular movement throughout. At the center of the page is a sort of circus wheel with heads attached to it. This central shape sets the tone of the page and keeps the reader’s eye moving. 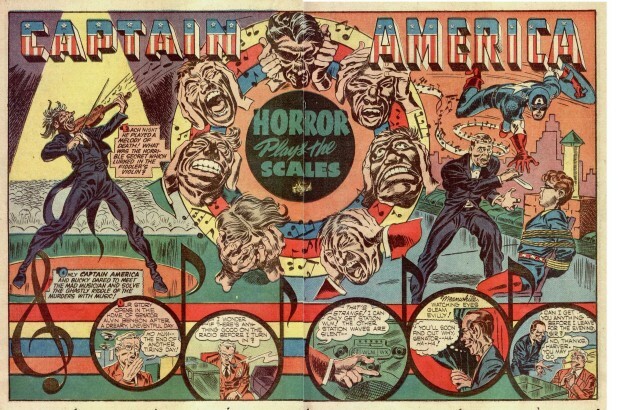 The eye sweeps from the violinist towards the lower right and around the circular panels composed of musical notes, up and around Bucky’s bound figure and over to the leaping Captain America. His torqued angle keeps the circle going back to the left. This is the use of composition at its finest. Posted May 25, 2015 in Uncategorized. It’s interesting to study the period when Kirby and Lee had just started reintroducing superheroes into the lineup of what was to be published for the fledgling Marvel line. At that point, Kirby was still crafting the lead story in a series of monster comics. 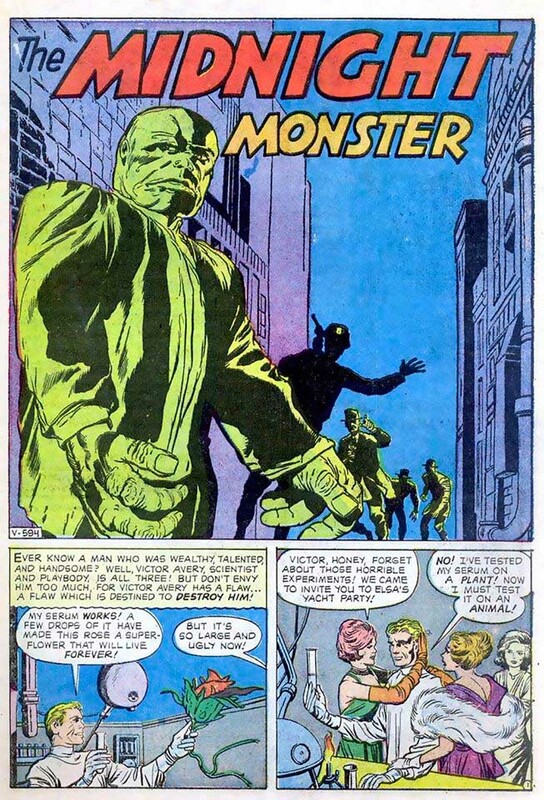 Such an example in the April 1962 issue of Journey Into Mystery #79 was entitled The Midnight Monster. The main character in this story bears more than a passing resemblance to The Incredible Hulk, whose first issue appeared a few scant months later. 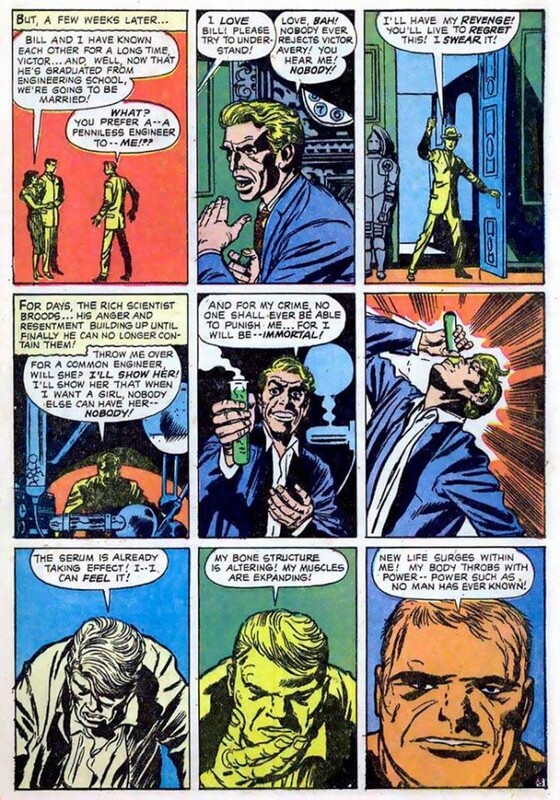 Note in particular the similarity in the transformation scenes of the two comics, appearing on page five of the Hulk and page three of “The Midnight Monster”, wherein we see a scientist morphing into a strange and frightening creature. Notice also also that in the very beginning of the series, Bruce Banner turned into The Hulk when the sun went down, a sort of Midnight Monster himself. 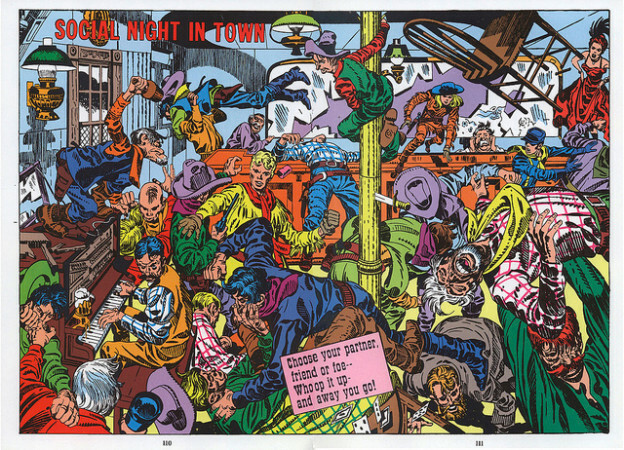 Many people see this Midnight Monster story as a Hulk prototype, and also see it as strong evidence that Kirby’s eclectic creativity was the primary force behind the profusion of characters that flowed from Marvel in a matter of months in the early 1960’s. 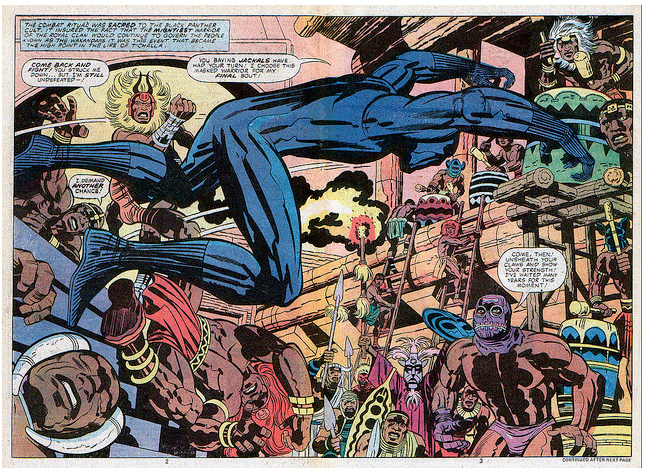 Kirby is such a powerful visceral and visual storyteller, that his spirit infuses the narrative with his essence. In most cases, it is not the concept that is important, it is the style and vitality of the creator that makes the character come alive for the reader. 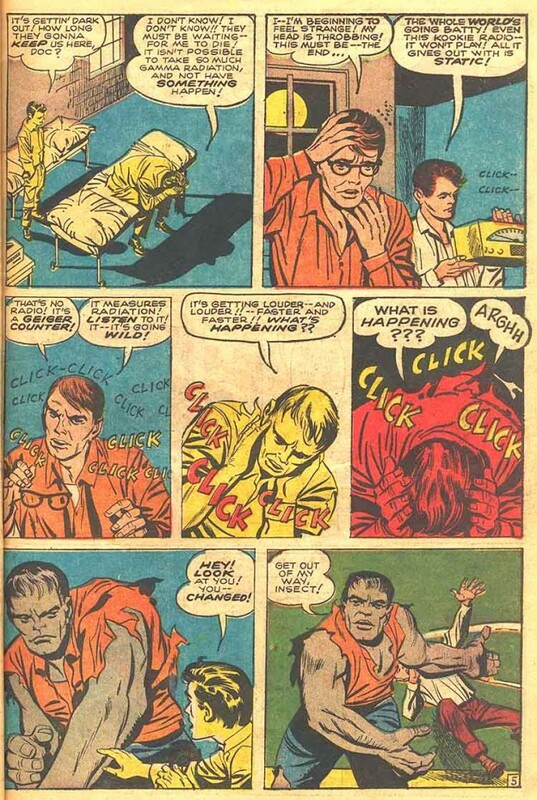 We also have compelling evidence of Kirby’s initiating the creative process nearly this early in the torn pages of a Hulk story, possibly intended for Issues three or four, in a period where the Hulk still has some sort of psychic connection to Rick Jones. 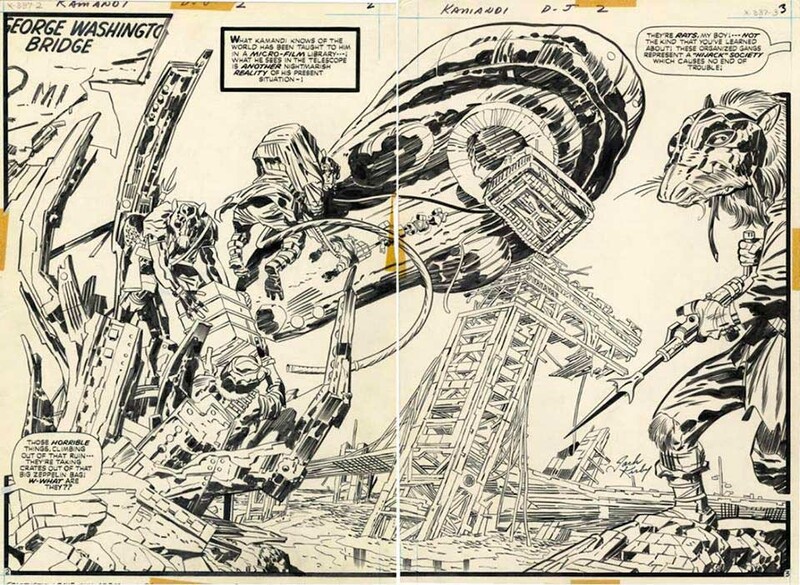 The pages in question, such as the pencilled one below were brought by Kirby to Lee’s office for approval, and have Lee’s notes written on them as though the two were discussing the dialoging before the communication broke down. It was reported that Kirby tore the pages in half and threw them in the trash in anger after Lee rejected them. In a note written by Kirby that was used as evidence in the recent (and resolved) legal action between Disney/Marvel and the Kirby heirs, the King stated that he had created the Hulk which was a spin- off of a single story that he did for Marvel. This story, “the Midnight Monster” may very well be the story he refers to. The characters in both tales are infused with a similar menace and with an old-world gothic aura that is so much a part of Kirby as to be an indelible signature.